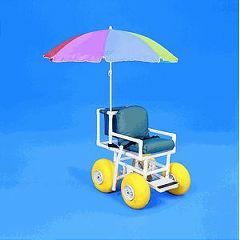 Front wheels - 19.3" x 9", Rear Wheels - 11.8" x 7"
Seat Height from ground - 25"
Product weight - 100 lbs. Comfortable. Rolls easily over beach. The cotter pins were put in backwards, so we can not take it apart like we thought we could. It is too wide to fit through a standard gate. Great for beach. Disassembles for flying. Fits in back of van. We live only one block from the beach so I push my wife to the beach every day. Unfortunately the dog pulls on the level and down the ramp: we cannot get her to pull up the ramp. It easily gets in the back of the van without disassembling. One time we went to the Bahamas and it easily went as checked baggage, disassembled. People stop us on the beach and ask where we got it. We probably could have bought, and resold for a profit, a dozen of them. We did not find the umbrella really useful. How easy is it for someone who had a stroke to get into it?